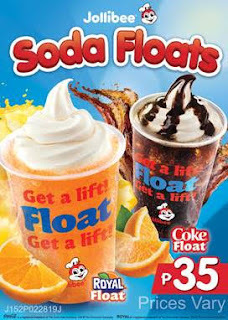 Home Coke Float Jollibee Royal Float Stay cool for the summer with Jollibee’s Coke and Royal Floats for just 35 Pesos! Stay cool for the summer with Jollibee’s Coke and Royal Floats for just 35 Pesos! This summer, the most refreshing way to cool down is with the Jollibee Coke and Royal Floats! It’s a refreshingly cool combination of your favorite ice-cold soft drinks: the classic cola and zesty orange. Top these beverages with a perfectly twirled vanilla soft-serve ice cream, a new and improved formulation—now creamier, thicker, and slow-melting. Coke Float offers the soda and ice cream combination with a chocolatey twist. Sweet chocolate syrup is generously drizzled over the vanilla soft-serve to bring in all the flavors together. Meanwhile, Royal Float brings the zest of orange with the creaminess of vanilla for a delightful beverage that you’ll crave over and over again! The Coke and Royal Floats are perfect complements to your favorite Jollibee meals and treats, but are also great to enjoy on their own! *Prices may vary across different locations.